CoastalME (Coastal Modelling Environment) is a new modelling environment to simulate decadal coastal morphological changes of both open coast and estuarine geomorphological systems. CoastalME follows the appropriate complexity modelling approach described by French et al. (2016). Morphological evolution is simulated through interacting raster and geometrical objects which follows certain user defined behavioural rules (Payo et al., 2015). 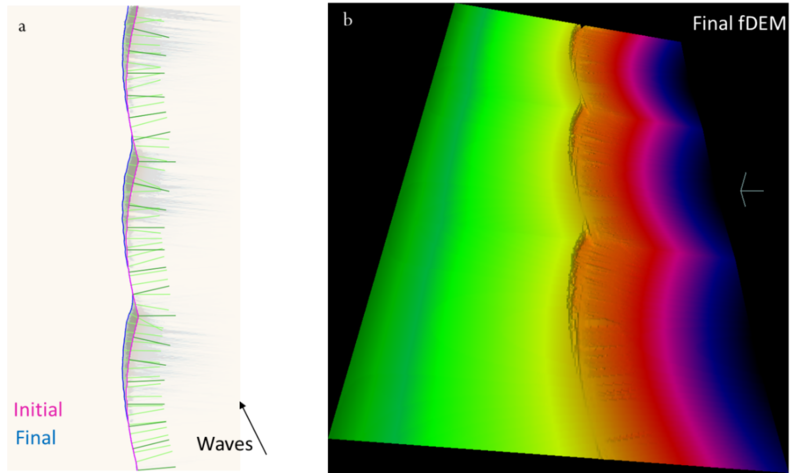 The novelty of the modelling environment is on the dynamic interaction between the raster sediment accounting and the simplified geometry (lines, areas and volumes). The raster grid allows to represent the quasi-3D spatial heterogeneity of the coastal geomorphology. The shape objects provides a reduced number of shape elements at the appropriate spatial scale (i.e. larger scale than individual's raster cells but small enough to simulate a given coastal stretch). CoastalME is a new developed framework fully developed within the iCOASST project. Building on the essential characteristics of several models that have a long history of use, CoastalME provides a new overarching framework that enables parameterizations and testing. iCOASST has supported a proof-of-concept example illustrates how this new modelling framework can be used to couple together models independently developed for sedimentary open-coast and rocky shore models. In particular, the integrative capacity of the proposed software modelling environment is demonstrated by unifying the following behavioural models: Soft Cliff and Platform Evolution model (SCAPE), (Walkden and Hall, 2011), Coastal One-line Vector Evolution model (COVE) (Hurst et al., 2015). We have selected these models because they represent two ubiquitous coastal landforms (cliffed coast and sandy shores), and both are adequate for decadal and longer simulations of coastal morphology changes. behavioural models operating on some abstraction of a full 3D topography/bathymetry (e.g. shorelines, shore profiles, sandbank/delta volumes, estuary volumes/cross sections, estuary channel networks, mudflat areas), and appropriate make some classification of the modelled landforms (e.g. one-contour models apply to curving sandy rich coastlines, SCAPE models apply to shore profiles). 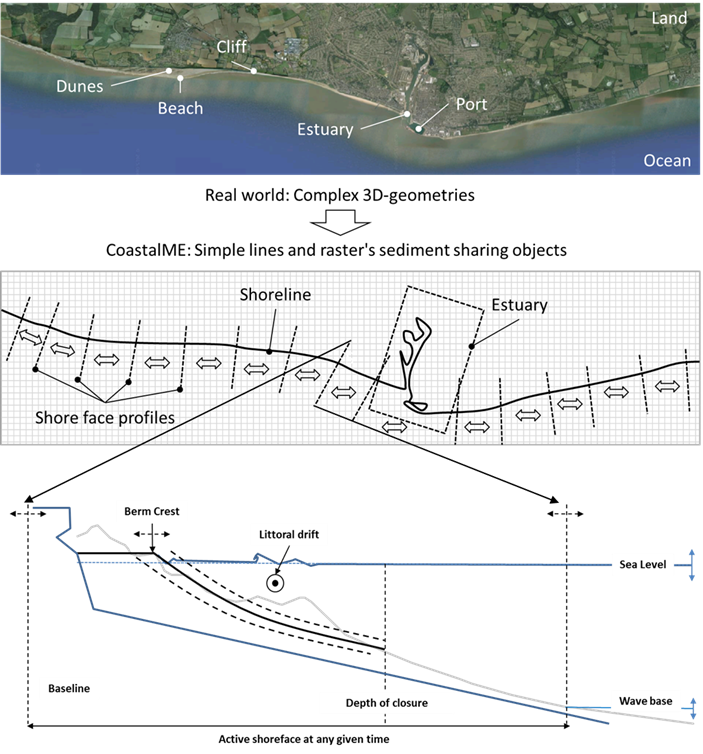 SCAPE approach is used to represent shoreface profile and the vector line model by Hurst et al. (2016) is used to represent diffusive and non diffusive shoreline behavior. Since different simple mathematical descriptions or rules might produce similar behavior ('morphological equifinality'), the framework needs to be able to assess not only the intrinsic uncertainty but also the structural uncertainty associated with the different plausible parameterizations. This is addressed by the application of the Object Oriented architecture design and programming paradigm (using C++ as the main programming language). This architecture provides the flexibility required to allow multiple customized rules to be switched on/off as needed within the same overarching quantitative framework. It also allows the necessary integration between the complementary geometrical-objects and the raster representation of the coastal topography. The software architecture is developed under open source licence to facilitate the subsequent development and implementation of these behavioral rule libraries by the interested research community. A realistic but not real 'pseudo-topography' example has been used to illustrate the operation of SCAPE-COVE within CoastalME. The 'pseudo-topography' covers an area of 1 km by 100 km with square raster cells of 1m length. The initial DEM is assumed to be only consolidated shore platform (e.g. no beach made of non-consolidated material). The consolidated shore platform is assumed to be a well-mixed mixture of 80% of sand and 20% of mud mass fractions with no gravel fraction. The consolidated platform is assumed to have a constant slope of 10 degrees with a weak alongshore sinusoidal variation creating three bay-shapes alike along the coastline. Payo, A., Hall, J.W., Favis-Mortlock, D., Ives, M., 2015. A multi-landform numerical framework for modelling large scale coastal morphodynamics, In: Wang, P., Rosati, J.D., Cheng, J. (Eds. ), The Proceedings of Coastal Sediments 2015. World Scientific Publishing Co. Pte. Ltd., San Diego, CA, p. 14. French, J., Payo, A., Murray, B., Orford, J., Eliot, M., Cowell, P., 2016. Appropriate complexity for the prediction of coastal and estuarine geomorphic behaviour at decadal to centennial scales. Geomorphology 256, 3-16. Hurst, M.D., Barkwith, A., Ellis, M.A., Thomas, C.W., Murray, A.B., 2015. Exploring the sensitivities of crenulate bay shorelines to wave climates using a new vector-based one-line model. Journal of Geophysical Research: Earth Surface 120, 2586-2608.